Another, and perhaps a more expressive word for Hinduism would be: Indian Paganism. The Christian missionaries call "Pagans" all those who are neither Christians, nor Mohammadans, nor Jews, that is to say, all those whose religious tradition has no connexion with the Bible and tradition of the Jews. We accept the word, because it is a convenient one. It points out some sort of similarity between all non-creedal religions of the past as well as of the present day. Once, practically all the world was "Pagan." Now that half its people have been converted either to Christianity or to Islam, the number of Pagans is less. That is no proof of the lesser value of different Paganisms, compared to the great creedal religions. It is surely an advantage, to be numerous; but it is no virtue. And therefore the number of its followers has nothing to do with the value of a cult. We have remarked that among the so-called Christians, there are more and more people who are no total believers in the Bible at all, but "free thinkers." And we have said that free thought in all matters, including religion, is a feature of Hinduism. This does not mean that we consider all the free thinkers of the World as Hindus. Philosophically, Hinduism is an attitude of mind, and an outlook on life. But it is not only that. It is a number of cults, among which one may choose. And, whatever cult it may be, it is a cult, one of the immemorial Pagan cults, surviving in the midst of the modern world. The Hindus are one of the few modern civilised people who are openly Pagans. The Japanese, with their official Shintoic ritual, are another of these people. And they being one of the leading nations of the modern world, their example is priceless. They show magnificently that, even if it be indispensable to adopt any new mechanical inventions, in order to compete with other nations, and live, yet it is not necessary to adopt the religion and the civilisation of the inventors, wholesale. Aeroplanes and war-tanks, and modern banking business on a broad scale, can perfectly go together with the existence of a Solar dynasty of king-Gods, in whose Godhood everyone actually believes, as well as an Egyptian did, six thousand years ago. When India, freed from internal weakness and foreign yoke, will become again a world power, then she will, still better perhaps than Japan, stand as a witness of such sort of truth as this. In the meantime, she remains the last great country of Aryan civilisation, and, to a great extent, of Aryan tongue and race, where a living and beautiful Paganism is the religion both of the masses and of the intelligentsia. If those of Indo-European race regard the conquest of pagan Europe by Christianity as a decadence, then the whole of Hindu India can be likened to a last fortress of very ancient ideals, of very old and beautiful religious and metaphysical conceptions, which have already passed away in Europe. Hinduism is thus the last flourishing and fecund branch on an immense tree which has been cut down and mutilated for two thousand years. We like this word "Paganism," applied to the Hindu cults. It is sweet to the ears of more than one of the fallen Aryans of Europe, accustomed to refer to "Pagan Greece," and to "Pagan beauty" as the most perfect expressions of their own genius in the past. That is also why we use the word, preferably to any other. India has perhaps never enjoyed yet, even in the days of her glory, the world-wide popular fame she enjoys nowadays. This world-wide fame is greatly due to the repeated assertion of Hindu "spirituality," and to the philosophy of non-violence, preached by Mahatma Gandhi. Very few people have grasped the spirit of Christ as well as Mahatma Gandhi, and several other prominent Hindus of the present day and of the last century. And among the few Europeans who have been sincerely attracted by Hinduism, practically all have sought, in it, if not a doctrine, at least a moral creed, or, better say a moral attitude of love and kindness -- the very same thing they could have found in Christianity, if only they took the trouble of separating the simple and luminous personality of Christ from all theological and heretical entanglements. In other words it is, generally, the dream of a better Christianity that brings fair people from across the seas to "serve mankind" in the Ramakrishna Mission, or to express their pure devotional love as inmates of some Vaishnava Math. The Hindus of the present day like such admirers. Many of them also like the idea that there is more true Christian spirit among outstanding Hindus, than among most Christians. There is nothing to say about these likings, if not that they are, to a great extent, a subtle expression of unfortunate India's deep-rooted inferiority complex. Pure spirituality (realisation of one's soul) naturally transcends creed, as well as ceremonies. So a realised Hindu will look like a realised Christian. That is true. It is true also that, in such a complex set of teachings as those contained in the innumerable Hindu books (including Jain, Buddhist, Vaishnava etc., scriptures), there are many elements which are to be found also in Christianity. Others will say that there are a great deal of Hindu elements (or Buddhist elements) which have creeped into Christianity, and there are theories to prove this influence of Indian thought. And one may safely assume that the failure of Christian preaching among the educated and fully conscious Hindus, is mainly due to the existence of these elements. A religion of love is not a new thing to India, as it must have been to the people of ancient Europe. But all this does not lessen the fact that the Hindu religion, both as a set of philosophies and as a cult, has also the characteristics which Aryan Paganism had, before it was overcome by Christianity in the West. We find here, like in ancient Greece, contrary philosophical tendencies, with a very few main common ideas between them (such as the idea of transmigration of souls, for instance, and one or two others). And, what is more, we find in Hindu cult, in Hindu life, that essential thing, which is the only one worth living for: Beauty. Visible beauty leads to the invisible, says Plato. Nowadays, when people speak of India, they seem to speak too much of its invisible beauty, and to ignore the visible. "Spirituality, spirituality...." They all talk of it, those who know something about it, and those who know nothing. It is the fashion. One does not look like a friend of India, if one does not put stress on that point. Nor does one feel like a true Indian patriot. To a great number of Hindus, the Hindu ritual has a great symbolical value. To the large majority of the Hindus, it is practically everything. Yet, nobody puts stress upon the visible beauty of the Hindu daily "puja," of the Hindu festivities, of the Hindu ceremonies. Many educated Hindus seem to think it below their dignity to praise, in their religion, what appeals to one's eyes and ears, what is "exterior." But it is not possible to deny the attraction of beauty. We have mentioned the burning regret of the past, among some Western Aryans, who seem to have a retrospective consciousness of what their race was, and an idea of what perhaps it could have been still, had their ancestors been faithful to the old national cults of Europe. This nostalgia for the past is not a new thing in the Christian West and Near East. It begins sixteen hundred years ago, with the desperate attempt of the Emperor Julian to restore the religion and society of the "Ancient World" to their former splendour, and it increases, in the heart of the few, as the "Ancient World," seen from a greater distance of time, seems more and more lovable. This Ancient World had its shortcomings. It had its vices also, which brought its down-fall. But its wise men were the pride of human intelligence. And above all, it is lovable for what Europe and the Near East have never known since: the open cult of Visible Beauty. This cult is to be found nowhere, nowadays, except in to last sunny home: Hindu India. It is said that, one day, Julian tried to organise a procession through the streets of Constantinople, in honour of Dionysos, the God of impetuous Joy, and overflowing Life. But it was already too late, and the attempt proved a failure. The procession was but a ridiculous show, and when returning, at evening, after it was finished, Julian was as sad as if his eyes had embraced the whole gloomy future of the Mediterranean World. It is said that he was sitting in the gardens of his palace, in front of old blocks of marble, half-hidden with ivy, when a faithful friend, guessing the cause of his sadness, asked him: "What else did you expect? These are the days of our death. What was your aim, in ordering this procession? What did you want?" The Emperor looked at him silently; then, pulling aside the ivy, he pointed out to him what was behind: a master-piece of some artist of the ancient days: a procession in honour of Dionysos, carved out in white marble; a smile of the World's youth; a thing of beauty: "This is what I wanted." This was at the time when the great Samudra Gupta was ruling over India. Oh! if only Julian could have seen what a display of beauty, in daily life and in festivities, and in processions in honour of Gods and Goddesses much akin to his, was going on, over there! If only he could have seen that Aryan Paganism would live and flourish forever, in that luxuriant land; that India would preserve the World's youth from age to age, through an endless future! Then, certainly, he would have blessed the great country, with tears of joy. Just go to Madura or to Rameswaram, nowadays, and see a real Hindu procession there, with elephants bearing immemorial signs of sandal and vermillion upon their foreheads, and draperies of silk and gold flowing over their backs, down to the ground; with flutes and drums, and torches reflecting their light upon the half-naked bronze bodies, as beautiful as living Greek statues; with chariots of flowers, slowly going around the sacred tank. Just see the pious crowd (hundreds and thousands of pilgrims, gathered from all parts of India), throwing flowers, as the chariots pass. And above all this, above the calm waters, the beautiful crowd, the mighty pillars, the huge pyramidal towers, shining in the moon-light ... above all this, behold the one, simple, phosphorescent sky. Just watch an ordinary scene of Hindu life: a line of young women walking into a temple, on a festival day. Draped in bright coloured sarees, sparkling with jewels, one by one they come, the graceful daughters of India, with flowers in their hair, with flowers and offerings in their hands. In the background: thatched huts, among the high coconut trees and green rice-fields all around -- the beauty of the Indian countryside. One by one they come ... like the Athenian maidens of old, whose image we see upon the prize of the Parthenon. The lover of Beauty, Julian, the Sun-worshipper, if only he could have seen them, would have said, beholding the reality of his own dream: "This is what I wanted!" 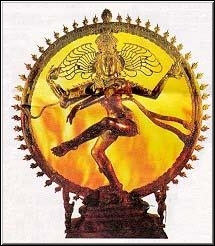 But it is not through the forms and colours of popular Hindu cult alone that Hinduism is a religion of beauty. Its conception of God, creative and destructive, is the expression of a broad artistic outlook on life and on the universe. In creedal religions, the centre of interest is man; the background, man's short history, man's misery, man's craving for happiness; the scope, man's salvation. God, man's Father, has a particular, and somewhat partial tenderness towards this privileged creature of His. In intelligent Hinduism, this anthropomorphic view has no place. The centre of interest is this eternal universe of Existence, in which man is only a detail. God is the inner Force, the deeper Self, the Essence of that Existence -- the "Greatest Soul." (Paramatma). No personal likings and dislikings, in Him. No special favour to any of the creatures that appear and pass away, in the course of time. Nothing but an endless succession of infinite states, of infinite expressions of the unknown Thing, which is the reality of all things; a dancing succession of birth and death and rebirth, over and over again, which is never the same, and yet, is always the same; a play, (lila) which has no beginning nor end, nor purpose, but which is beautiful, whatever may be the temporary fate of any particular species, in its course. The fate of all species, of all individuals, is to grow slowly more and more conscious of the beauty of the Play, and, at end, to experience their substantial identity with the Force which is playing -- playing with its own Self. Nobody knows what this Force is, except those who have realised it in themselves. But we all adore It, and bow down to It. We do not bow down to It because we know It, and because It is God. It is because we bow down to It, that we call It God. And we bow down to It and worship It, in its millions and millions of expressions (those which destroy us, as well as those which seem to help us), because, in its millions and millions of expressions, It is beautiful. Creation and destruction are one, to the eyes who can see beauty. And the greatest praise to India is this: not only are her people beautiful; not only are her daily life and cult beautiful; but, in the midst of the utilitarian, humanitarian, dogmatic world of the present day, she keeps on proclaiming the outstanding value of Beauty for the sake of Beauty, through her very conception of Godhead, of religion and of life. The preceding text is the third chapter of Savitri's A Warning to the Hindus (Calcutta, 1939).